It is an inexpensive one of Yonex. It is a feather of water birds! I can not feel anything more than the value worth. There are no turns other than when it is basically striking or serve practice, how can I use a new article anyway? If the price of this class, you should already buy 300 yen and bought a standard from another company's product of 2500 yen. Clear trajectory is not natural (deep high clear does not fall down properly from the top), there is no durability noteworthy either. It can be said that it is just for price. Unnatural flight, poor hit feeling (bad, bad? ), Feathers that are relatively easy to go, relatively bad balls that are mixed occasionally Some people are bothered by others. I do not want to use it in game practice, but at this price it feels like this. 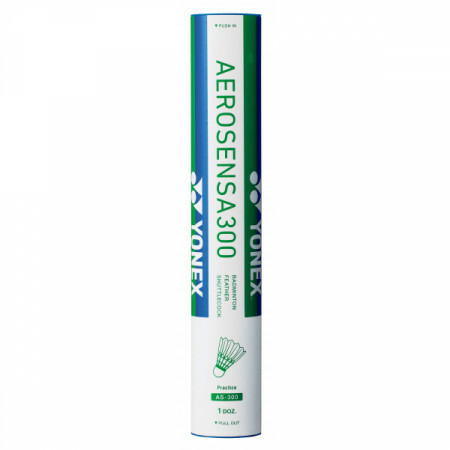 Aero sensor 300 is Yonex's badminton shuttle. The shot feeling when hitting with a racket was also good and there was also durability more than expected. There is a characteristic that it is easy to control because the shuttle flies beautifully when you hit it. Aerosensor 300 is mainly used for exercise. Although it is still not durable compared with the New official etc, it is enough for basic practice. Even if the feather breaks, it will be used for knock practice or until the end. Boiled water	It is an impeccable durability shuttle. I chose this shuttle to depend on the word-of-mouth, because I wanted to select a durable shuttle as it was. I used it in anticipation, but it was hard to break due to impeccable durability. Also, I like the flight performance as the shuttle flies beautifully when hit. I feel that the feeling of hitting is a bit heavier, and the smash rally with a sense of speed continues. It is suitable for trying an approach assuming an actual game, it is easy to drive from any angle. Although the price is somewhat higher, I feel that quality including flight performance is certain. The high flight performance which does not blur in the air is attractive, and I feel the high quality of the point that individual difference is small. It is a relatively cheap price shuttle so it is excellent in terms of cost performance. It is a point that can evaluate the feeling of shot feeling soft and familiar. I use it as a shuttlecock that combines durability that can withstand long-term specifications without problems and excellent flight performance. It is a point that can be evaluated as one of the big advantages that it is easy to replace with reasonable price.